It’s a two-piece planter. One portion is an inner planter, that holds the live plant. The second is a decorative shell. This allows you to mix and match plants and shells whenever you want, without having to replant. The best part is that this planter is self-watering, so the roots always have access to the water they need. Remember to always water from the top of the planter, so the soil stays hydrated and the reservoir stays full for the roots to access water as needed. 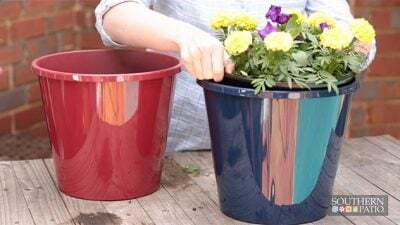 The overflow hole prevents you from over watering, so you can keep your plants with confidence.